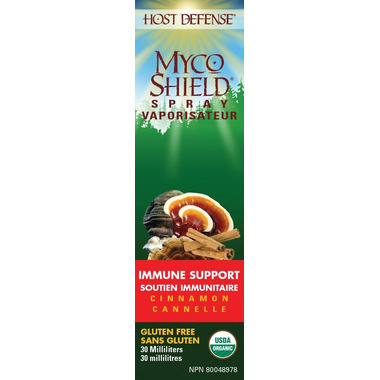 Host Defense MycoShield spray combines five powerful polypore mushroom species: Agarikon, Red Reishi, Chaga, Birch Polypore and Turkey Tail. These five mushrooms provide a unique “shield” of immune support, available in a perfect traveler’s size. Flavored with certified organic cinnamon oil, MycoShield offers a refreshing taste and is a must-have item for travelers on the go. Immune Support. Certified Organic. Full Spectrum of Active Constituents. Grown & Process in the USA. Purity Assured. Sustainably Cultivated. Serving Size: 0.42 mL (3 sprays). Apply three pump sprays into mouth and then swallow, twice per day. Fresh Agarikon mycelium extract, Fresh Reishi mycelium extract, Fresh Chaga mycelium extract, Fresh Birch Polypore mycelium extract, Fresh Turkey Tails mycelium extract, water, alcohol, myceliated brown rice, cinnamon essential oil. Do not inhale while spraying. Avoid contact with eyes. Shake well before using. Can be taken with food or without, on an empty stomach or as recommended by your healthcare advisor. Consult your healthcare advisor regarding the use of this product during pregnancy. Keep out of reach of children.